A ULA Atlas 5 rocket carrying NASA’s Solar Dynamics Observatory satellite rolls out to its Space Launch Complex-41 launch pad at Cape Canaveral Air Force Station in Fla., for a planned Feb. 10, 2010 launch. NASA's newest sun probe, the Solar Dynamics Observatory(SDO), is poised to launch Wednesday morning on a quest to study our closeststar. 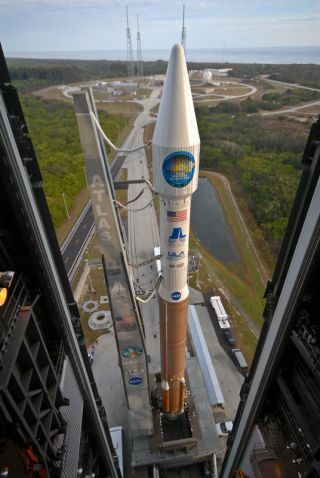 The new observatory is slated to lift off atop an Atlas 5rocket at 10:26 a.m. EST (1526 GMT) from Launch Complex 41 at Cape CanaveralAir Force Station in Florida. Though the mission has an hour-long window duringwhich to launch, strong winds and clouds could delay the liftoff. Only a 40 percent chance of favorable weather is predictedfor Wednesday's launch attempt, said U.S. Air Force Maj. Christopher Lovett,the launch?s weather officer. "It's going to be dicey," he said. "Within anhour there's a good chance that we'll see some opportunities." If the solarobservatory cannot blast off on Wednesday, NASA can try again Thursday,when a more optimistic 60 percent chance of good weather is predicted. The $850 million mission is designed for a five-year run tocontinually observe the sun to learn more about its magnetic field and volatilesolar weather. deputy associate administrator for programs at NASA's Science MissionDirectorate. The probe will gather higher quality data at a faster rate thanany previous study of the sun, he said. "We're all very excited about finally getting SDOup in the sky where it needs to be," said Stanford University scientist PhilScherrer, principal investigator of SDO's Helioseismic and Magnetic Imagerinstrument. Visit SPACE.com for launch updates and complete coverage of NASA's Solar Dynamics Observatory from Staff Writer Clara Moskowitz in New York.